The biggest show in the history of pop music came to Vancouver last week (November 16), in the form of the Jacksons’ Victory Tour. It was a dazzling display of lights and lasers, mechanized staging and slick choreography, available to anyone who wanted to shell out $40–and in three nights 107,000 fans did just that. As expected, Michael Jackson stole the show from his brothers, spinning, leaping, and ‘moonwalking’ to the tune of “Beat It” and “Billy Jean”–from his multiplatinum album Thriller–and other songs from his years in the Jackson Five. Two of the show’s most magical moments were the opening segment–in which four computer-controlled “Kreetons” (camel-like monsters) prowled the stage in a medieval “Sword in the Stone” fantasy skit–and Michael’s vanishing trick, in which he was corralled into a silver box by two huge, black automated spiders and then lifted into the air and blown up–only to reappear on a platform stage left. A seven-story, 44-metre stage–that takes 240 workers five days to erect–housed over 2500 lights and 240 custom-built speakers. But for those who went to hear as well as see the shows, the sound system was a disappointment. With ten musicians playing and the five Jacksons singing, the result was one shrill barrage of sound. 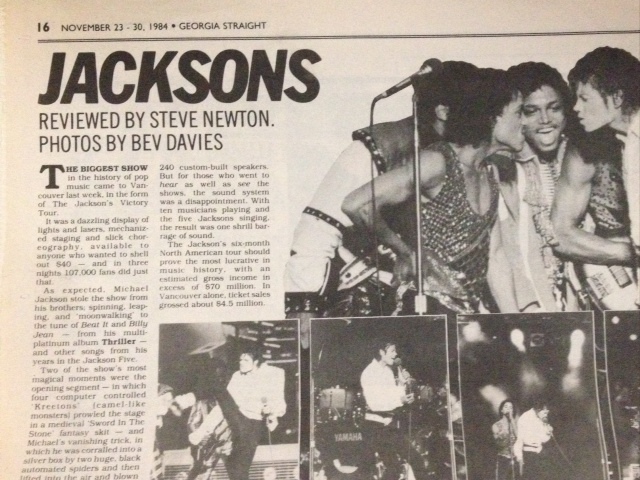 The Jackson’s six-month North American tour should prove the most lucrative in music history, with an estimated gross income in excess of $70 million. In Vancouver alone, ticket sales grossed about $4.5 million.